The Erie County Medical Center Chilled Water Plant receives a much needed upgrade, reduces annual energy consumption 46%. M/E Engineering recommended a replacement and upgrade plan designed to support both impending and future building expansion, with improved reliability and redundancy. Increased efficiency would translate to energy savings and qualify for NYSERDA incentives. A significant challenge was to complete the project on the aging infrastructure of a fully functional hospital and trauma center with no significant plant interruptions. Existing Chilled Water Plant equipment ranged in age from 37 years (original equipment) to 16 years old. 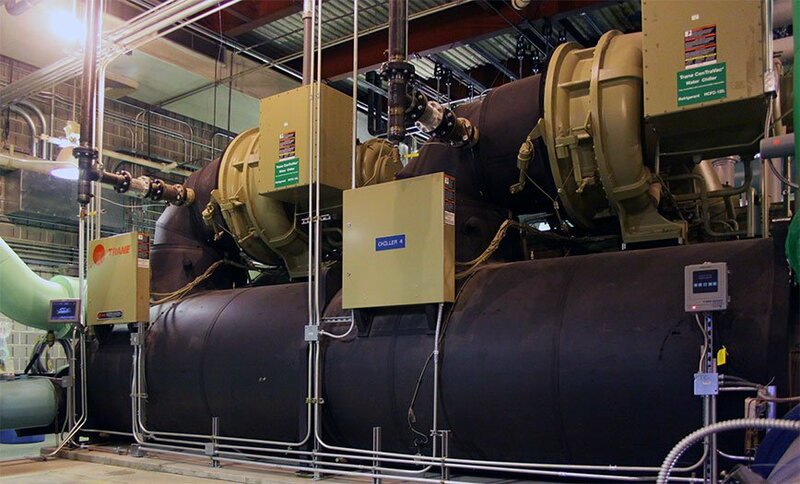 The existing 4,800-ton Chilled Water Plant was upgraded with the addition of two 2,400-ton chillers, bringing the total plant capacity to 7,200 tons, and improving efficiency, and redundancy. All cooling towers were replaced with highly efficient, water saving, variable speed cooling towers. An important feature to this complete overhaul is a more intelligent plant management system with state-of-the-art valve control system and a Siemens “Demand Flow” all variable speed plant control system. A total of 18 primary and secondary chilled and condenser water pumps were replaced and the pumping system was converted to an all variable flow system including conversion of existing air handling unit 3-way control valves to new 2-way pressure independent valves. The control system for the entire Chilled Water Plant, including condenser water pumps and cooling towers was also upgraded to include a demand flow plant optimization control sequence. 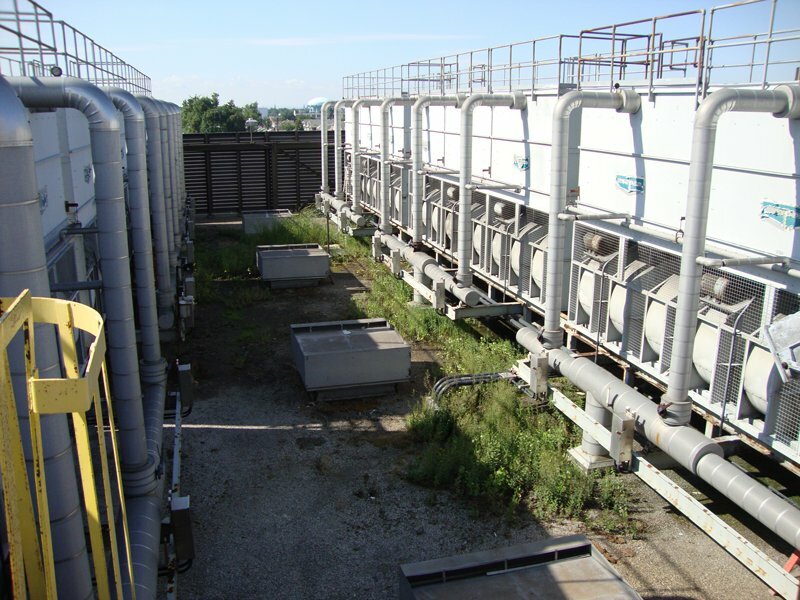 The addition of a heat exchanger to act as a waterside economizer, provides the ability for the plant to achieve "free" cooling when the outside air temperature is 34°F or colder. 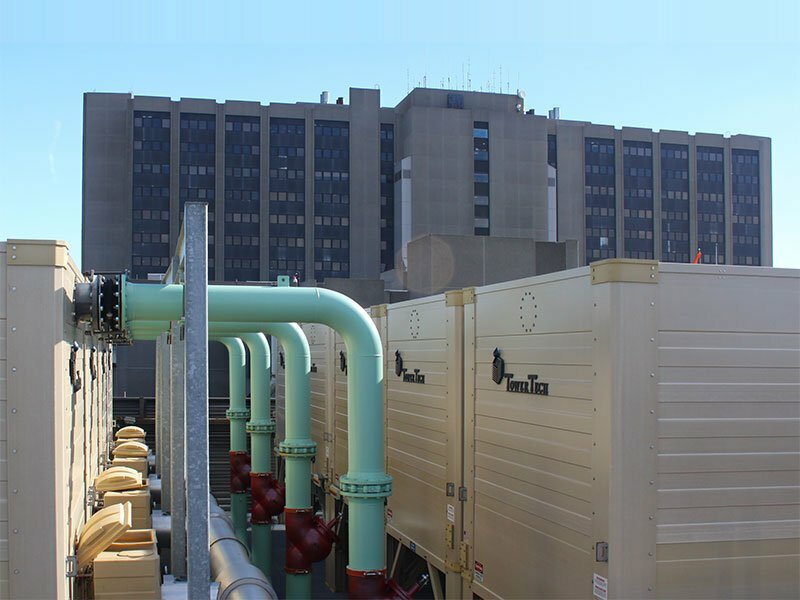 In its first year of operation, the plant was able to meet the chilled water needs of the hospital without operating any chillers for over 950 hours, and that number is expected to increase to 1,500 hours annually. The entire project was completed with no extended downtime of the plant, over a one year period, from 2012-2013. The plant upgrades have been operational for over a year. As part of the NYSERDA incentives program, detailed measurement and verification was required in order to document or confirm the results of the implemented energy improvements. A summary of the results indicate that the projected savings are being achieved as planned. NYSERDA (New York State Energy Research and Development Authority) incentives granted for the Chilled Water Plant totaled over $1 million. The new ECMC Chilled Water Plant expansion and energy efficiency measures designed and implemented by M/E Engineering project to an annual energy savings of $170,000. During the first 12 months after implementation the chilled water plant's annual energy usage was reduced by 24%, while serving a 40% larger campus with a plant peak tonnage demand that increased by 17%. Overall energy expense of annual kWh per square foot for cooling has been cut by 46%.